Pour popcorn and peanuts into a paper grocery bag and set aside. Place sugar, corn syrup and butter in a microwavable bowl and cook for two minutes (high temperature). Stir thoroughly to combine, and return to the microwave for one more minute. Add vanilla and baking soda, beat with a whisk or electric mixer until frothy. 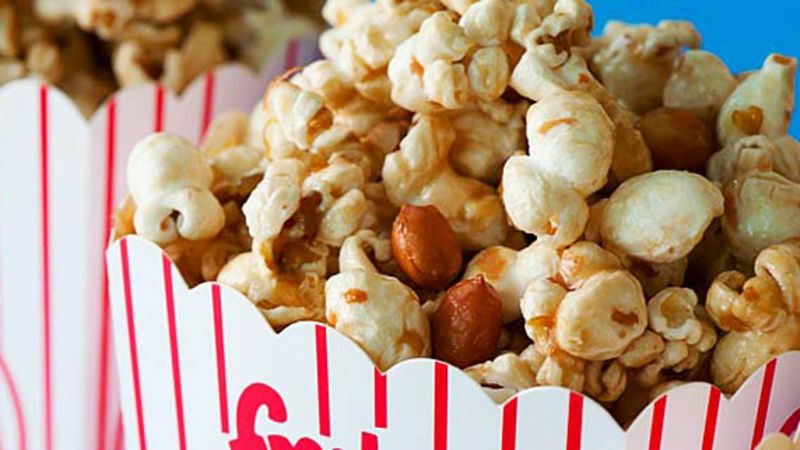 Pour the caramel mixture over the popcorn and peanuts. Fold down the top of the bag to seal and shake vigorously until the popcorn is evenly coated. Pour caramel corn onto a high sided cookie sheet, turkey roaster, or other large baking dish. Bake at 200 °F for one hour, stirring thoroughly every 15 minutes. Caramel Corn, served in red and white popcorn boxes, is a fun game day treat on whether you are tuning in at home, or doing a little pre-game tailgating. I remember my mom making a similar recipe to this one when I was growing up, a recipe involving a brown paper bag and several visits to the microwave. I still shake my caramel corn in a paper bag when making this recipe– it helps with an even coating. However, instead of cooking in the microwave for several one minute intervals (shaking in between), I bake the caramel corn in a low heat oven to get it nice and crisp. I don’t know if microwaves were hardier when I was a kid, but my modern-issue microwave just doesn’t cut it, and I like my caramel corn nice and crisp! Caramel itself can sound tricky, and difficult – with all the boiling and the timing, time, but this version is so easy, and just as delicious as the boiled syrup versions. Just combine butter, brown sugar and corn syrup in a microwave safe bowl, and cook as directed. Next, add the baking soda and vanilla and whip with a whisk or an electric mixer until frothy. Get out your trusty brown paper grocery bag. Pour the popcorn and peanuts into your handy dandy brown grocery bag, pour in the caramel, fold down the top to seal, and shake vigorously until evenly coated.